A microscopic space always exists between the restoration and the prepared cavity due to lack of adhesion of restorative materials which results in passage of saliva and salivary products between the cavity wall and restorative material applied to it. This clinically undetectable passage of bacteria, fluids, molecules, or ions has been defined as marginal leakage or microleakage. Recent studies have shown that coronal microleakage is a significant factor in the prognosis of root canal treatment., Moreover, the amount of coronal leakage that occurs within a short period of time (3 days) should be considered as a potential etiologic factor of the root canal failure., Temperature fluctuation has also shown to adversely affect the marginal seal of a dental material. Thus, thermocycling is included in the in vitro study of microleakage because it closely reproduces in vivo condition. This study was conducted in the Department of Conservative Dentistry and Endodontics, Yenepoya Dental College, Mangalore. A total of fifty extracted noncarious unrestored human maxillary anterior teeth with intact crowns and roots were selected. They were stored in 10% formalin until the beginning of the study. The teeth were cleaned of calculus and debris using ultrasonic scaler under water spray and kept in 3% sodium hypochlorite solution for 24 h to remove any organic debris. The canals were instrumented using stepback technique and sodium hypochlorite (3%) and hydrogen peroxide (3%) were used as irrigants for each specimen alternatively. The coronal two-thirds of each canal were flared using Gates-Glidden drills up to no. 3 size. The specimens were obturated with Gutta-percha using zinc oxide-eugenol (ZnOE) as sealer and by lateral condensation with vertical compaction technique. Gutta-percha was removed from the coronal part of the teeth using a heat carrier instrument up to 3.5 mm. The teeth were then randomly selected and divided into six groups out of which four were experimental groups and two control groups [Table 1]. In experimental groups, there were 10 teeth each and control groups had five teeth each. The roots of all experimental groups and the positive group were coated with three layers of nail varnish except for the area of coronal orifice. Teeth in the negative control group had the entire surface including coronal orifice were coated with nail polish. The teeth were then immersed in 2% methylene blue dye solution for 3 days. All sealing materials and Gutta-percha were gently removed from the walls of the canal, and the entire circumference of the canal wall examined for dye penetration. The distance from the canal orifice to the maximum depth of dye penetration was recorded and calculated in millimeters. The data were then subjected to statistical analysis and the difference in the sealing ability of the different materials were compared [Figure 1]. The dye penetration was observed in all groups except the negative control teeth. The positive control group observed the maximum leakage. The lowest mean leakage was in the Fermit-N group followed by (in ascending order of dye penetration) Cavit-W, ZnOE, intermediate restorative materials (IRM), and positive control [Graph 1 and [Table 2]. Endodontic treatment is aimed at preventing microorganisms from entering the root canal system or eliminating them if already present. Thereafter, a fluid-tight seal is obtained to prevent bacteria from invading the apex. However, in recent years, research was directed more toward the coronal seal of teeth. Coronal leakage studies ,,, after completion of endodontic treatment have shown that the canal obturating techniques and materials do not provide fluid tight seal. Premixed temporary materials provide excellent seal consisting with the findings of Marosky et al ., Chohayeb and Bassiouny  and Anderson et al . The coefficient of linear expansion for cavit was almost double that of ZnOE, which explains its effectiveness as a temporary filling material. Large dimensional fluctuations resulting from thermocycling. Thermocycling procedures. Deveaux et al. and Parris et al. Higher P/L ratio of 6 g/ml Pashley et al . Mixing process and resulting lack of homogeneity Deveaux et al. Variations in the volume of IRM due to contraction Deveaux et al. Dye penetration was observed in the entire specimen except in the negative control group. Fermit-N showed better sealing ability compared to all other materials used in the study. Cavit-W was the second best material. ZnOE showed better sealing properties than IRM. IRM showed the maximum dye penetration of all the materials. Swanson K, Madison S. An evaluation of coronal microleakage in endodontically treated teeth. Part I. Time periods. J Endod 1987;13:56-9. Chong BS. Coronal leakage and treatment failure. J Endod 1995;21:159-60. Crim GA, Mattingly SL. 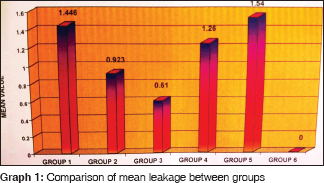 Evaluation of two methods for assessing marginal leakage. J Prosthet Dent 1981;45:160-3. Deveaux E, Hildelbert P, Neut C, Boniface B, Romond C. Bacterial microleakage of Cavit, IRM, and TERM. Oral Surg Oral Med Oral Pathol 1992;74:634-43. Blaney TD, Peters DD, Setterstrom J, Bernier WE. Marginal sealing quality of IRM and Cavit as assessed by microbiol penetration. J Endod 1981;7:453-7. Noguera AP, McDonald NJ. Comparative in vitro coronal microleakage study of new endodontic restorative materials. J Endod 1990;16:523-7. Roghanizad N, Jones JJ. Evaluation of coronal microleakage after endodontic treatment. J Endod 1996;22:471-3. Marshal FJ, Massler M. The sealing of pulpless teeth evaluated with radioisotopes. J Dent Med 1964;16:172-84. Magura ME, Kafrawy AH, Brown CE Jr., Newton CW. Human saliva coronal microleakage in obturated root canals: An in vitro study. J Endod 1991;17:324-31. Khayat A, Lee SJ, Torabinejad M. Human saliva penetration of coronally unsealed obturated root canals. J Endod 1993;19:458-61. Marosky JE, Patterson SS, Swartz M. Marginal leakage of temporary sealing materials used between endodontic appointments and assessed by calcium 45 – An in vitro study. J Endod 1977;3:110-3. Chohayeb AA, Bassiouny MA. Sealing ability of intermediate restoratives used in endodontics. J Endod 1985;11:241-4. Anderson RW, Powell BJ, Pashley DH. Microleakage of three temporary endodontic restorations. J Endod 1988;14:497-501. Widernan FH, Eams WB, Serene TP. The physical and biological properties of Cavit. JADA 1971;82:378-82. Webber RT, del Rio CE, Brady JM, Segall RO. Sealing quality of a temporary filling material. Oral Surg Oral Med Oral Pathol 1978;46:123-30. Parris L, Kapsimalis P, Cobe HH, Evans R. The effect of temperature change on the sealing properties of temporary filling materials. II. Oral Surg Oral Med Oral Pathol 1964;17:771-8. Lim KC. Microleakage of intermediate restorative materials. J Endod 1990;19:16-8. Deveaux E, Hildelbert P, Neut C, Romond C. Bacterial microleakage of Cavit, IRM, TERM, and Fermit: A 21-day in vitro study. J Endod 1999;25:653-9.